08/15/17 IDOBATA 2.0 for win32/win64 was updated 2.33. 10/29/15 NOMI(Chisel) 4.0 for win32 was updated to 4.49. 10/29/15 ROKURO Pro3.0 for win32 was updated to 3.62. 05/08/15 SERIFU 1.4 was released. 02/03/15 TATARA 7.0 was updated to 7.292. 11/03/14 SOMATO 4.0 was updated to 4.72. 03/17/14 Coil Plugin 7.0 was updated to 140317. 12/24/13 KICNS 1.10 was released. 12/09/13 Rough Plugin 7.0 was updated to 131209. 09/16/13 KESHIKI 1.18 for win32/win64 was released. 08/26/13 ROKURO(lathe) 4.0 was updaed to 4.27. 07/22/13 Balloon Plugin and Height Cloth Plugin for TATARA 7.0 was released. 06/03/13 Plugins for TATARA Coil and Boxes Plugin v130603 was released. 05/18/13 Plugins for TATARA Cam and Gear Plugin v130518 was released. 05/12/12 KUMIKI1.34 for win32 was released. 03/14/12 KENBAN 1.0 for win32 was released. 07/17/10 HANKO 1.1.5 for win32 was released. 03/01/10 ObjCut 1.2.9 for win32 was released. 01/03/10 TUZURA 1.0.0 for win32 was released. 12/22/09 SHIBORI 2.0.17 for win32 was released. 04/09/09 UTSUSHI 1.0.4 for win32 was released. 03/22/09 NUIME 1.0.0a for win32 was released. 08/14/07 TOKOROTEN(extruder) 1.07 for win32 was released. I released the tutorial blog "How to make sculpted prim by TATARA" in English with the help of Gumi Yao and Dendre Benelli. It is English Version of https://kanaenet.blogspot.com. Though it is unofficial and there are still few articles, it is helpful. wrote here about the road map of my tool. Please check it. If you check the tools which can make Mesh files of Secondlife, please visit KANAE PROJECT Mesh Page. And you can check the tutorial to make a mesh object. Please visit How to make Mesh by KANAE PROJECT Tools. This Program makes Sculpted Prim texture .tga file. 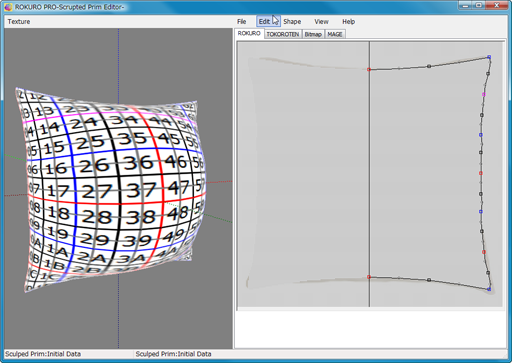 To make Sculpted Prim, this program has 7 modes and can preview it. TATARA mainly has the following functions. It has an easy edit function like a graphic tool. It has functions to shorten editing time, such as flip and mirror. It can output an OBJ file with a texture. And it can excport OBJ files to Blender. And it can make Collada for the mesh of Second Life. It has a simple pen function which draws a texture. This feature is helpful to note the prim's edges for texture creation. TATARA has a three day trial period so that you may see it operate. You are invited to try it. The main changes of TATARA 7.0 from 6.0 are as follows. Windows 64bit version and Mac OS X 32bit version was released. You can use plugin-system like ROKURO Pro. New function Objects Dialog on Tool menu was added. You can make multiple objects easily. You can edit selected control points by Numerical input. The form is drawn by DirectX. TATARA Tutorial Video - You can check the details of these tutorials at https://yuzurujewell.blogspot.com/. TATARA 4.0 TATARA 4.0 archive page for TATARA 4.0 users. TATARA 5.0 TATARA 5.0 archive page for TATARA 5.0 users. TATARA 6.0 TATARA 6.0 archive page for TATARA 6.0 users. This Program makes Sculpted Prim texture .tga file. 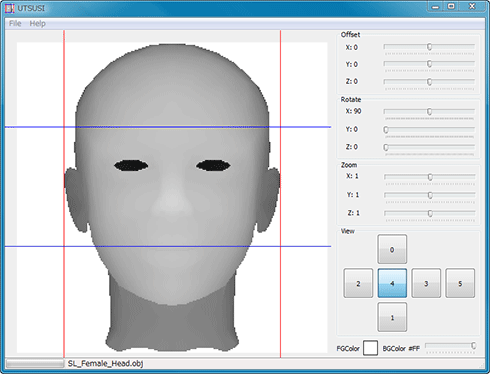 To make Sculpted Prims, this program has 4 modes and a preview pane. ROKURO Pro mainly has the following functions. It can integrate and use almost all the feature of ROKURO and TOKOROTEN. 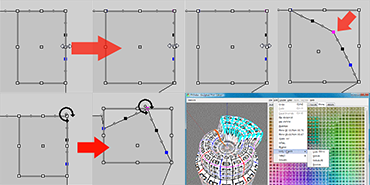 With a Bitmap tab, you can edit the location of all the control points of the sculpted prim. With the MAGE tab, you can create sculpted prims which are similar to bent pipes. So, you can make a wind instrument, an accessory, a neon sign, etc. easily. It can output an .OBJ file. 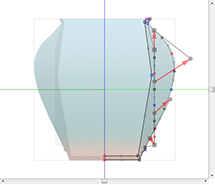 Other 3D editing tools can use the outputted .OBJ file. It can use the PSD file of Photoshop as a texture. 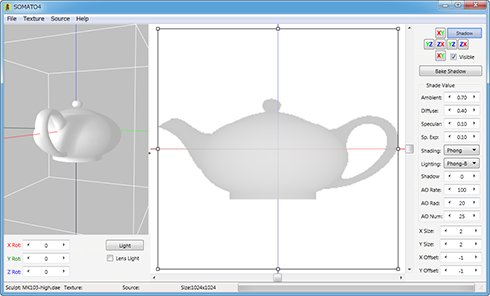 3D object can be previewed by a polygon. It is not NURBS. 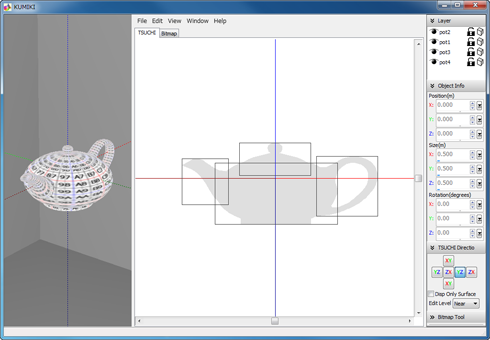 You drag your mouse and rotate the previewed 3D object. If you turn the mouse wheel, the zoom will go in and out. The following function was added. You can save Collada file for Mesh of Secondlife. The same UV map as the sculpted prim is outputted. Only High of LOD is outputted. *You can use plug-ins for ROKURO Pro 2.0. Because ROKURO Pro draws using OpenGL, it is stabilized like SecondLife and it operates well. ROKURO Pro works on Parallels Desktop 3.0 for Mac. And it also works on VMware Fusion. Thank you Caolila Inglis! ROKURO Pro has a three day trial period. You are invited to try it. 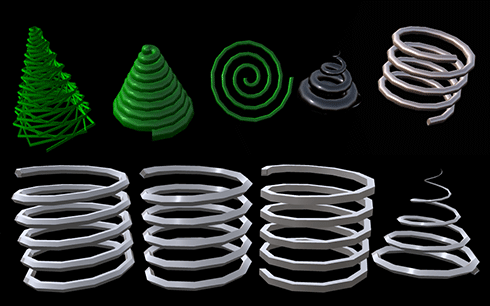 The user of ROKURO Pro 3.0 can make various coils like the following image easily using Coil plug-in. 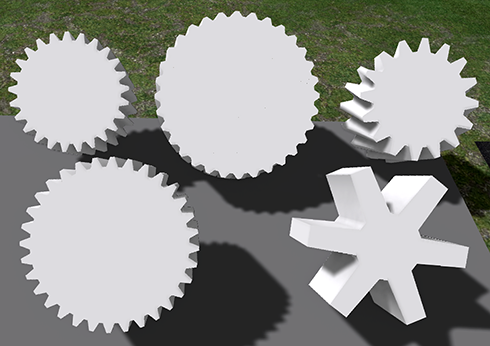 The user of ROKURO Pro 3.0 can make various gears like the following image easily using Gear plug-in. The user of ROKURO Pro 3.0 can make various cams like the following image easily using Cam plug-in. NOMI(Chisel) is Sculpted Prim Relief Maker. NOMI is the software which simply makes sculpted prim with relief contours from one picture using the brightness of it. A preview can be checked before uploading to SL. From the original picture, the software outputs a sculpted prim picture and a texture picture. Moreover, better relief can be achieved if the desired height information is added and processed. A user moves a control point, can smooth the surface of relief or can make the relief which is not a square. The mainly improved functionality is as follows. The interface of the edit pane was improved like KUMIKI. Wrap on the edit menu was added. The Edit Level function like TATARA was added. The Texture Update function was accelerated. The function which outputs a Collada file (.dae file) was added. You can make the Mesh of Second Life. KUMIKI displays both: sculpted prims and their textures. 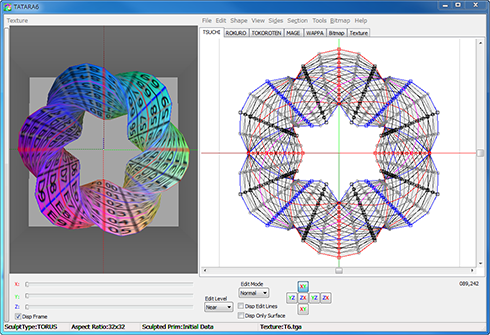 Multiple Sculpted Prims can be edited in the two modes: TSUCHI/Bitmap. 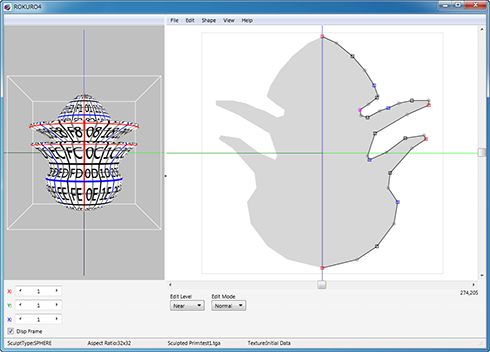 TSUCHI mode has two edit modes: object mode and mesh mode. TSUBO is a tool which assembles multiple prims of TATARA. TSUBO can make multiple prims from the textures on which you have full permissions. Please check my tutorial blog. SHIBORI shrinkwraps an OBJ file and single or multiple Sculpted Prims and outputs it to an OBJ file or Sculpted prim. You can make sculpted prims from OBJ file easily. You can wrap an object by three methods. You can wrap an object by 28 kinds of sculpted prims. You can adjust the gap. SOMATO will project a flat picture onto your sculpted prim and OBJ File and KANAE Collada File, and display it as the texture of your sculpted prim and OBJ File and KANAE Collada File. You can specify the strength of light, either Ambient or Diffuse. You can add the sculpted prim's natural shadow to the texture. You can make textures of multiple objects. The textures made from SOMATO are managed by the layer. 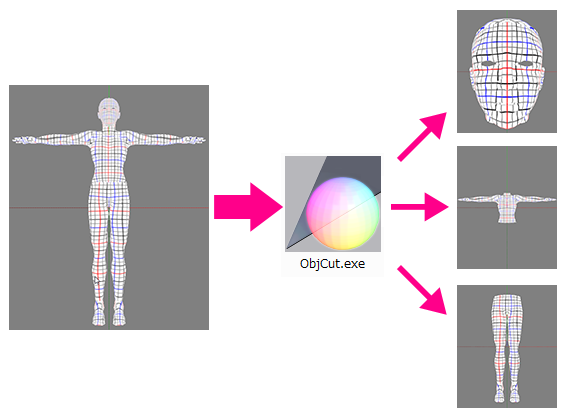 If you have an avatar OBJ file, you can make the texture of skin or clothes easily. 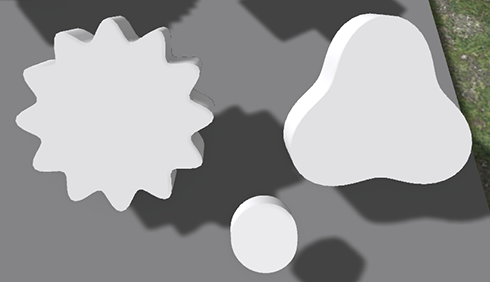 You can set the value of the ambient occlusion to shadow layer. HANKO is a tool which adds your signature image to the alpha channel of your Sculpt Map file. It protects your work from being stolen by a screenshot etc. And it also supports the aspect ratio of a Sculpt Map. ObjCut divides OBJ File by the material, the group, and the selected group. ObjCut 1.X users can use their password. IDOBATA is the tool which reads out the chat which saved as text by other software, such as Secondlife. It watches the chat file and speak the updated chat by Microsoft Speech API 5.4 or Microsoft Speech Platform 11. You can unify the voice and the chat. So, your in-world radio live will be extended. SERIFU is the software which reads out the script text file in the voice. You can use Microsoft Speech API / Microsoft Speech Platform. KENBAN is a Windows application that displays your keystrokes in a small floating window. You can customize the appearance of the display window. It can display either keyboard only, or keyboard and mouse actions. This Program makes Sculpted Prim textures .tga files for Second Life. And it can make Collada file for the mesh of Second Life. All the functions were reconstructed. Edit mode is almost same as TATARA. You can use the same function on Mac OSX. This Program makes Sculpted Prim texture .tga file of the extruded object. Stephen Zenith says,"I've just tried it using Wine on Linux, and it seems to work perfectly, just like Rokuro does." 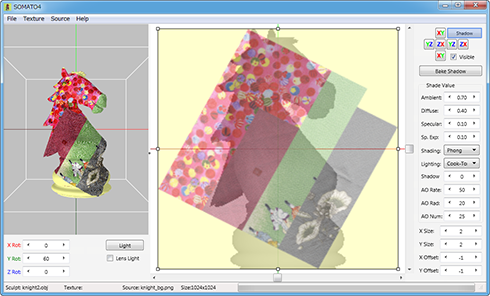 UTSUSHI is a tool which reads an OBJ file / KANAE Collada file and creates the background image for TATARA or ROKURO Pro or ROKURO or TOKOROTEN. And the outputted image can be used as Height data of NOMI. You can make the sculpted prim which an avatar attaches using this tool and TATARA. You can also combine multiple sculpted prims by them. TATARA and SOMATO judge the Stitching Type of a Sculpt Map automatically. 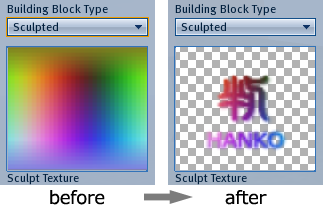 When they read the Sculpt Map which is output by a 3D tool, it may not be recognized correctly. 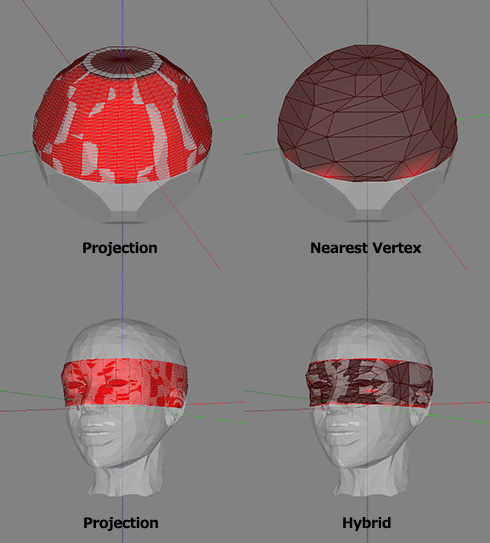 NUIME corrects a Sculpt Map so that Stitching Type of a Sculpt Map may be correctly recognized by TATARA or SOMATO. TUZURA is a program which changes the coordinate of an OBJ file for TATARA 5.0. It can correct the fault of the OBJ file which TATARA 5.0.137-140 and TATARA 5.0.144 output. And it can change the coordinate of the OBJ file of TATARA 4.0 for TATARA5.0. 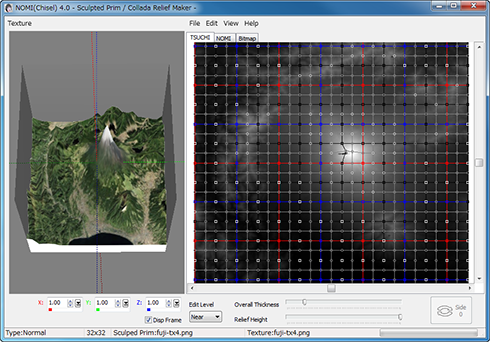 This program reads binary altitude map(BIL) and outputs a texture and height map in bitmap form. This program can also read the data of SRTM3 data(HGT) and the data of The Global Land One-km Base Elevation (GLOBE) Project. "KESHIKI" is the tool which capture the active window and save it automatically. So, you can capture the images for the tutorial of software simply. "KICNS" is the converter program from image files to OSX/Windows Icon file. Please donate in-world at KANAE PROJECT Shop(SLURL) Here is a donate box. It is a list of tutorial programs it is accepted that is very good as a result of my checking the contents. T2GO- Tutorial - Getting started with ROKURO by Lady Hathaway - you can buy it at my shop and her shop (500L$). *matika's* Tutorial in ROKURO - you can buy it at SL Exchange(550L$). Brian A. White(Ansel Gasparini) introduced my site by his book in the Sculpted Prims section of the Build chapter. You can buy it from here. Thank you! Ansel Gasparini. I spoke about ROKUOR Pro and Next New Tool at Sculpty Day II of Dr.Dobb's Life2.0 Spring (03/15/08 4:00 PM PDT - 4:30 PM PDT). Thank you for reading my awkward English. 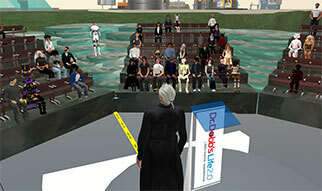 I made a speech about ROKURO Pro at SCULPTY DAY of Dr.Dobb's Life2.0 Fall (2007/09/16 15:30-16:00 SLT). Thank you for hearing my awkward English. I am thankful to KJ Georgette, John Zhaoying, Rissa Maidstone, and all the audiences. © KANAE PROJECT 2012 All rights reserved.